"Life itself tricks us. It misleads us… It paints one man a hero when he may well be a villain." Amazon Studios has debuted the full-length trailer for a generational romantic drama titled Life Itself, written and directed by Dan Fogelman, creator of the NBC series "This Is Us". This gorgeously, authentically emotional romantic drama stars Oscar Isaac and Olivia Wilde as a couple madly in love, and spans several decades of time examining passionate relationships and other interactions connected by a single "random moment." It's a "multi-generational and multi-layered portrait" of two families from America and Spain. The full cast includes Olivia Cooke, Mandy Patinkin, Annette Bening, Samuel L. Jackson, Laia Costa, and Antonio Banderas. This looks great, I'm considerably excited about it, even though I feel like it's going to be an emotional rollercoaster of feelings good and bad. Because that's just what life itself is about. Enjoy it. You can still see the teaser trailer for Fogelman's Life Itself here, to watch the original tease for this. Dan Fogelman's Life Itself centers on a couple (Oscar Isaac & Olivia Wilde) that lead a multi generational love story spanning both decades and continents, from the streets of New York to the Spanish countryside, and are all connected by a single event. 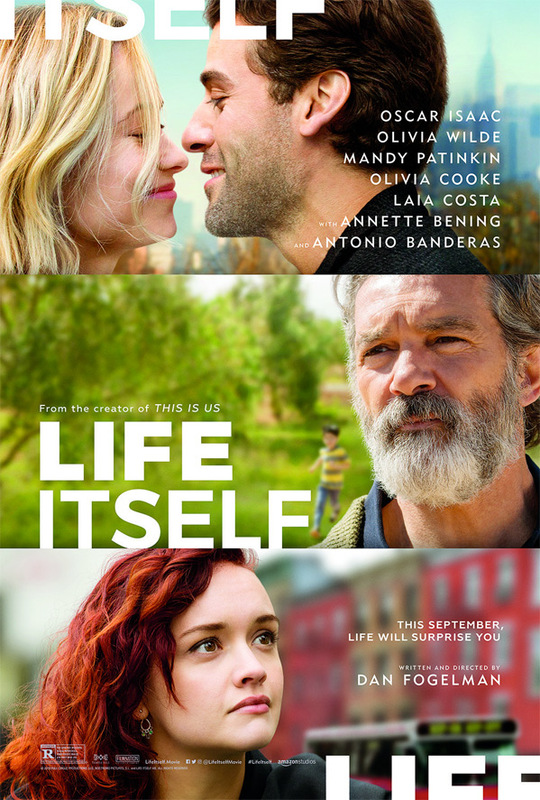 Life Itself is both written and directed by screenwriter-turned-filmmaker Dan Fogelman, director of the film Danny Collins previously, creator of NBC's "This Is Us", and writer of the screenplays for Cars, Fred Claus, Bolt, Tangled, Crazy Stupid Love, The Guilt Trip, and Last Vegas. This hasn't premiered at any big festivals. Amazon Studios + Roadshow will release Fogelman's Life Itself in select theaters starting on September 21st later this fall. First impression? Who's interested?